Fill out the form below and we’ll mail you a Turtle Jack’s Loyalty Club card. Don’t want to wait? Come on over to your local Turtle Jack’s Muskoka Grill location today and ask a team member for a card. The asterisk (*) indicates required fields. 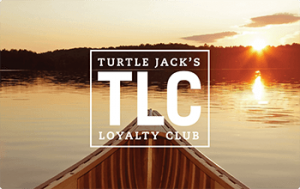 May Turtle Jack's Muskoka Grill contact you by email from time to time about information specific to your TLC account, such as ways to earn bonus points and other special offers like your $10 TLC Member Welcome Bonus? May Turtle Jack’s Muskoka Grill contact you by email from time about various other special offers, promotions, contests and events?